UPVC and Aluminium doors have increased in popularity in recent years across Northern Ireland. We have as a direct result of this popularity ensured that our locksmiths are up to date on all types of locks and problems encountered by householders with this type of security. Most modern day properties install UPVC doors & windows mainly to improve the aesthetic look of the property along with the bonus of improving sound proofing the property and reducing heat loss through ill fitting wooden equivalents. If you lose a key, break a key in the lock, unable to remove a key once door locked, unable to open despite unlocking no need to worry as we can solve all these issues. Frequently 3 point & 5 point locking mechanisms fail due to being fitted poorly, original mechanism was faulty or simply through mis use. Not only can we rectify this but we can make the required alterations to ensure no future reoccurrence of the problem. 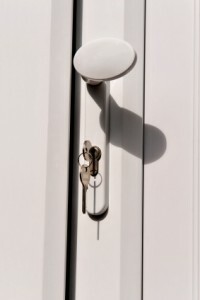 Our UPVC maintenance offers a full Locksmith Service for all PVC-U Doors. Our service includes Residential Doors, French Doors, Sliding Patio Doors, Tilt & Slide Doors. If your PVC door lock is catching, jamming, stiff to operate handle become unlockable, unable to open or you have an unresponsive/floppy door handle then we can repair or resolve the fault at a fraction of the cost of a brand new door, saving you a fortune in the process. When a door lock goes wrong 9 times out of 10 it’s because of parts becoming misaligned. With our diagnostic service we look into why your door has gone wrong without replacing parts unnecessarily. Your door may require its Hinges Adjusted, Screws Tightened or even Re Glazing. Be rest assured your door will work like brand new again once we finish!